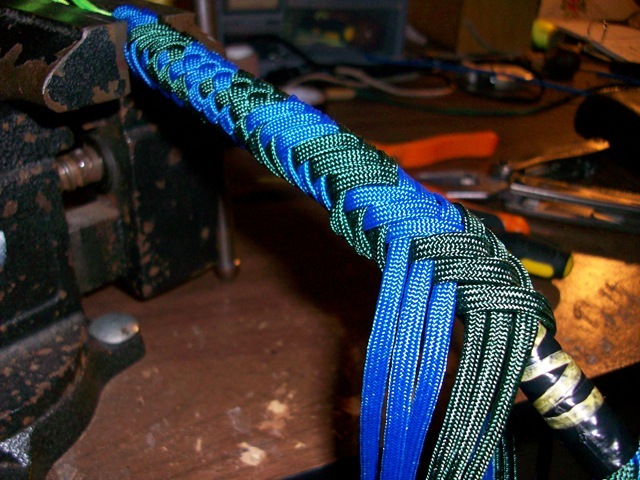 When I began building whips, I followed the mantra, “Plait loose, pull tight.” I believed that it wasn’t possible to pull too tightly, & that you could always pull tighter. After building hundreds of whips & plaiting thousands of feet, I’ve come to some different thoughts on the subject of plaiting. Some people may disagree with me & that’s fine. In fact, many improvements I’ve made in my own whipmaking, & life in general, is by doing things a bit differently. After all, if we all did everything exactly the same, where would be the diversity? Things would be pretty boring. I believe that the tightness of plaiting is relative to the material you’re working with, whether it be nylon, polyester, kangaroo or cowhide. Most of my whips are built of nylon, but I’ve made many leather whips. I’ve also broken many strands of leather, both kangaroo & cowhide. Was I pulling too hard? If the strand in question broke, then I’d said yes. Now the strand being pulled may have had a defect in it, was a bit thinner in that section or whatever. Bottom line is it broke. I’ve never broken a strand of nylon and probably never will, unless it was defective. Nylon stretches a bit. The polyester I’ve been using of late does not stretch like nylon. It’s much stiffer. In regards to nylon whipmaking, I do believe that you can pull too hard at times. 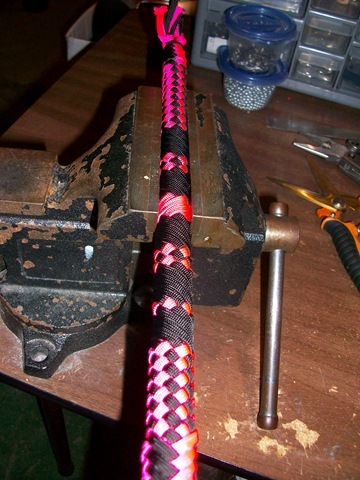 For myself, I vary the tension in my plaiting throughout the whip. For instance, I don’t plait as tightly on the handle area as I do on the thong. I do pull a bit tighter on areas where I drop strands, tighter than normal. When doing fancy plaiting, I don’t crank on the strands, but concentrate on a neater appearance in the patterns. Overall, my whips have been known to exude tight plaiting. EDIT (5/11/11): Thought I’d add a bit to this last paragraph. While plaiting the handle portion, I do use a bit more tension on the transition area, that part where the core attaches to the handle. Please don’t think that I’m suggesting the handle doesn’t need to be plaited tightly, that’s not my intent. I simply don’t use as much tension on the handle portion as I do on the main body of the whip. For newer whipmakers, I always advise to watch how you pull your strands. Don’t use jerky movements, trying to muscle the strands. Instead, use a more controlled & even tension when you pull. When first starting out, your seams will migrate a little. That’s natural, as every whipmaker has dealt with this same problem when first beginning to make whips. This basically means that more tension is used on one side over the other. This is where you need to concentrate on using the same tension with both arms. A quick mention of using a vise in plaiting. I’ve used a vise for almost the entire time I’ve been building whips. In all honesty, the use of a vise wasn’t to keep my seams straight. I don’t view the use of a vise as a crutch, dependant on keeping straight seams. What I didn’t want was the whip constantly turning with each strand pulled. The wrist is a very complex part of the body, & I’ve always been concerned with injuries developing here, such as carpal tunnel. Any excess movement from side to side puts more stress on the wrists. This is the main reason I decided to use a vise early on in my whipmaking. It prevents the work from turning & twisting during the process of pulling strands tight. I think that straighter seams are an added benefit of using a vise. EDIT (5/11/11): Another addition here. The vise also helps with other things. I also use it for attaching stockwhip keepers & for binding the bellies on all whips. It acts as a third hand. Another reason I use a vise is that I would rather sit & plait than stand. In my former years of machining & sheetrocking, I was always on my feet. This put a lot of stress on my lower back, which I have problems with from time to time. Sitting at my bench, I’ll plait several feet of a whip while in the vise, then unclamp it & move it up, then clamp again. That way I can remain pretty much in the same area while sitting. I realize this isn’t a very comprehensive post on plaiting, but just some basic thoughts on the subject. Becoming a good plaiter isn’t something you attain to, but something you’re always practicing, always becoming better at. I’m always learning ways to improve my plaiting, always working to become better. This entry was posted in whipmaking. Bookmark the permalink. Although I only use kangaroo hide for my whips, I found these observations well reasoned, widely applicable, and quite useful. Thanks for sharing your thoughts and experiences, and for the updates as well, which I heartily encourage you to continue to build on. Thanks for reading the blog & taking the time to comment, it’s much appreciated! It’s in my heart to continue posting things here. Thanks for the support!